Most of you know that I am a lover of tea. But I also love my coffee. Funny how that habit never formed until I was in my 40’s….but form it did and I am always up for the occasional cup. My morning usually starts with a cup in bed while I check my emails, comments and Facebook. Probably not the best idea to have a white duvet on the bed but I do and so far it has survived with only a couple little tan spots appearing on it over time. I am the most careful of coffee drinkers, I guess! I was overcome with sadness when our library’s in house coffee shop closed last December . My day was made when the announcement was made that North Iowa Vocational Center would open up in the empty space. To me that was a win win situation to train and empower persons with disabilities to serve in a coffee house setting. I am getting to know the gang that started in April—-Mary Kate is the Tuesday morning gal and today I was served by the lovely Marissa . Bill is the go to guy who oversees the operation and I am so grateful that he is able to help these wonderful folks do jobs that are fulfilling. I love that they are here and hope that people really get into the library to support them. In other news I found out that our local HyVee (which is within walking distance of our home) was opening a Starbucks in their faculty!!! Yum! I loved watching the store come together within the store and Chris and I visited on opening day on Monday. It was everything I hoped for and more. The baristas were excited and pleasant–the manager, Sheena, was encouraging and supportive and they already seemed that they were working as a team. Chris says I will never leave Mason City now that we have all these wonderful places . He may be right. Maybe. We will see. Some of the opening day crew at work! GENIUS!!!! Little cup holders for your grocery cart!!!! Perfect! Have you ever waited for a store or a convenience to come to your area and been as excited as I am about my new coffee shops??? Tell me about it! I support our local coffee houses, but I’m still a Starbucks fan. Current drink is a Carmel Crunch Frappuccino. Does it count as coffee? Yes. Our neighborhood cleaners changed owners about 4 years ago and I was so sad because the old man and women who ran it had spoiled my boy for a lot of years. They were sad too, but chose new owners with a lot of heart and personally introduced us to them. They moved to Arizona…I like to think all my ironing helped them retire in style. A thrift shop open just across the street—I buy spoons there since mine disappear at an alarming rate (no idea, how we lose spoons). And I will admit with pleasure that I was thrilled when a Potbellies and a Target opened about a mile from us. Yep, ” neighborhood grand openings” are always fun an exciting! Have a wonderful day! Love it!!! Someone else who gets excited about stuff like this!!! The dry cleaners sound amazing. A real family run business who cares. Which reminds me—-I think I might have left something at our cleaners. They don’t give you tickets and something sticks in the back of my mind that I had something there a long time ago…..squirrel!!! 🙂 Add another errand to the list today! I’m a chai latte fan myself. Enjoy the new place and a white duvet would never last in my house. Miles and Att would destroy it the first day. I like Caribou Coffee, but they have pulled out of Illinois I am told. Oh yea–they were closing a bunch of those I know or combining them with a tea company. Bummer. 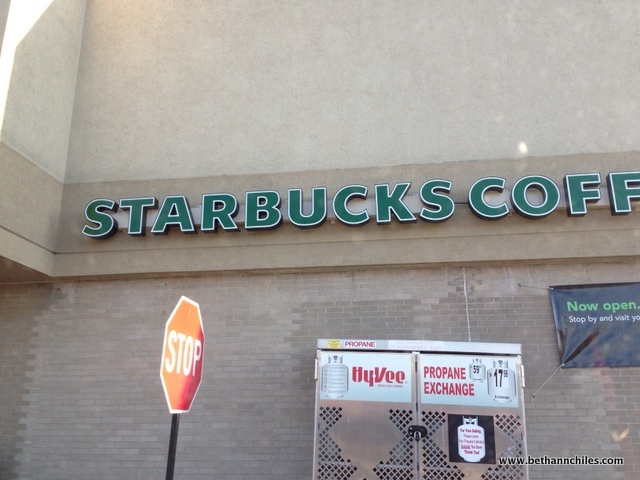 Our HyVee has a Starbucks, too, opened quite some time ago. I’m not much of a coffee drinker, although I do stir up a cup of instant French Vanilla cappuccino every morning. I’m pretty certain true coffee drinkers would compare that to white bread. I love that your library has a coffee shop and employs persons with disabilities. i guess I am not such a coffee drinker as my daughter. I usually have one cup for breakfast and if I am at a party with something sweet to eat, I will have coffee. I don’t think I am quite as bad as Paula but I do love my coffee in the morning first thing (as you know) and then if I am out and see a coffee shop it is a nice pick me up. Hahahah!!! Snow seems to be in the past right now–we are rainy and gloomy today but the rain is needed so I will be content!!! I am a little bit excited just now. Target has just arrived in Edmonton! We have 3 stores now! I haven’t been in any of them yet, but I’m looking forward to my first visit. I just hope they have an electronic cart so I can spend some time in the store. Gosh I don’t remember if ours has electric carts or not—-i would be surprised if they didn’t but I don’t actually remember seeing any ever there. I love Target!!! Hope you get to enjoy them soon! I have been reading some of your comments – what the heck is Chick-A-Fil-A? People keep referring to some big scandal about this & then in your comments people are hoping for them? No, not too much information. Thank you for enlightening me. Congratulations Beth Ann on your Starbucks and the North Area Vocational Center. Our HyVee and Target both have Starbucks but they are about 25 minutes away in Jefferson City, MO. I don’t drink coffee but CH does. Yes Yes YES!!!!! I am as excited about the Chick-fil-A that is coming to our Kinda Big City, Jefferson City. Love those chicken nuggets! Now if we could just get a Dierbergs supermarket! Ooohhhh Chick-Fil-A—my life would then be complete!!!! You need to go when you check on Buddy and Holly!!! You will be right there!!! I am sure you could learn to be a barista!!! !